I've been reinventing myself my whole life. From corporate finance and banking, to outdoor educator and wilderness mountain guide. I made and sold my artwork for 15 years. I am a self taught naturalist, cosmetic chemist, entrepreneur, lifelong learner and creator. I had been crafting soaps and lotions for family and friends for almost 20 years as a hobby until one day, in the summer of 2014 I launched Colorado Real Soap with a folding tabling, a stack of my Olive Oil soaps, a dozen jars of Paw Bliss and a pop-up tent at the bustling Crested Butte Farmers Market. I sold out in 2 hours. I knew I had just stepped onto a yet another new path in life. I retired from the art show circuit and dove headlong into a new career at 49! 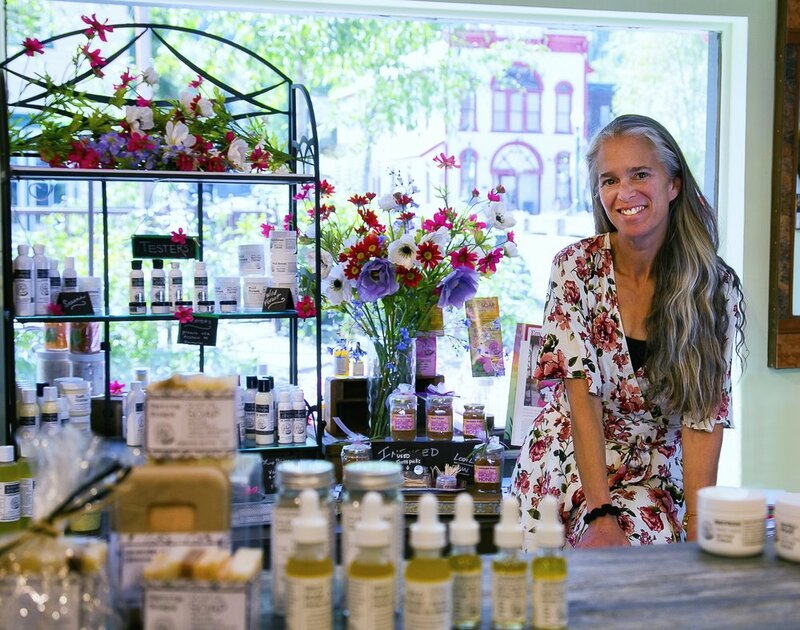 In May of 2017 I opened my boutique in Crested Butte.I no longer vend at the Farmers Market. My shop is located in downtown Crested Butte and my unique creations are now carried in a handful of stores in various locations. RECONNECTING PEOPLE. At the very heart of my mission is reconnecting people to the wild world. I do this by infusing wild forest plants into my creations and sharing them with you. I hope that every time you use them you feel the love and power of the wild world. HELPING OTHERS. I thrive on helping others. I get great personal satisfaction when you get good results with my creations. When you let me know you are happy, your skin's happy and you are feeling good using my products, it inspires me to continue learning and expanding my offering of unique, wild forest infused creations to share with you. NOURISHING TRADITIONS. The foundation from which I draw inspiration comes from the past - I strive to provide you with nourishing skin care traditions combined with natural products to help support and restore balance by reconciling our modern lifestyles with the needs of this vital organ. These many years later, sharing my world with you in a simple, sustainable, healing way is now my mission in life. I carefully collect small amounts of medicinal plants from the mountains surrounding my home. Infusing them into unique formulas which capture the power, quintessence and soul of this unique and special place. Leaves, blossoms, buds, petals, bark and roots all find their way into your hands. It's my way of helping you reconnect with the healing power of the wild world from your place on the planet. I am very fortunate to have two highly trained and skilled individuals (also friends) with whom I consult to create my products. One is a professional herbalist of 27 years, the other is a retired cosmetic chemist of 30 years. I receive guidance and knowledge from these generous, brilliant ladies to whom I am eternally grateful. I have attended numerous workshops and take online courses in cosmetic chemistry and herbal skincare in order to continually improve my offerings. My husband, Jeff is my foraging partner and enabler - he has generously supported me in all of my endeavors. Jeff is also a self taught naturalist and forager. When I am not playing around in my lab you can find me outside playing in my backyard, or foraging for wild plants. I have lived in this remote place almost 30 years now. Prior to taking taking a "break" to see Colorado in 1991, I had earned a degree in finance and economics from the George Washington University in DC. I worked for a large bank in South Florida, then moved to NYC for a job in corporate finance. I went back to school for a degree in secondary education and taught business skills in adult education. I became terribly depressed. I took up oil painting and taught myself how to paint the mountains in my head. I knew I needed LIVE in that landscape, at least for awhile. When I arrived the soaring peaks grabbed hold of me and have never let me go, I am captive here, and I want it no other way. The mountains healed me, escaping the urban world breathed life back into my spirit and eased my mind. I knew I would never go back to the "other world". Instead I stayed and carved out a beautiful life. I fell in love and married a beautiful man who shares my love for the wild. I learned to climb rocks and mountains, ski deep powder and ride the wild waves of rivers. I discovered forest food and medicinal plants. And so began a lifelong appreciation for learning and discovering the healing power of the natural world. Jeff's capable hands hold cottonwood buds collected in the spring, destined for infusing into oils to create cleansing blends and healing salves.